This is an amazing video of a cat named Muggsy who fights 12 feet long gators who weigh 800 pounds – and wins. I have two cats so I have an idea about size and I’m guessing Muggsy weighs about 10 pounds and his ‘weapons’ are nothing compared to the alligators. 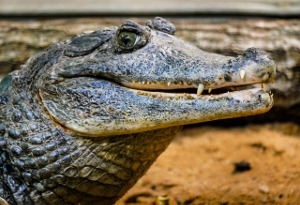 He just wandered into a gator farm and was adopted by the owners who claim that Muggsy is now more of an attraction to visitors than the gators themselves. It’s fun to watch this video, but that’s not why we posted it. Most people hearing about Cat vs Gator would say it’s IMPOSSIBLE for the cat to survive, much less win the battle. Yet he does. Again and again. How many ‘rules’ do we have in our lives that are absolute malarky? How does Muggsy do it? Clearly there is something about his energy which intimidates the alligators. He is so confident, so determined that these animals won’t eat ‘his’ food or hang out on ‘his’ territory that he is fearless. And they know it. And that’s much more important than anything this brave cat can actually do to harm them. After all, being swatted by a tiny (from their perspective) cat paw is quite trivial in terms of danger yet they’re so intimidated they slink back into the water when faced with his determination. So the next time you find yourself thinking that something, anything, is “impossible”, you might want to stop a moment and consider if that’s really true. After all, just because it doesn’t fit into our map of the world doesn’t mean much of anything. We just might be wrong.